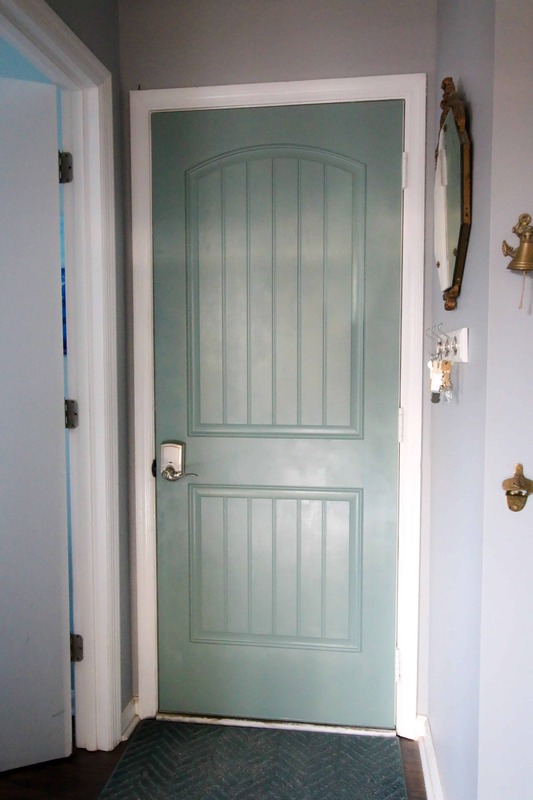 Curious about painting interior doors? 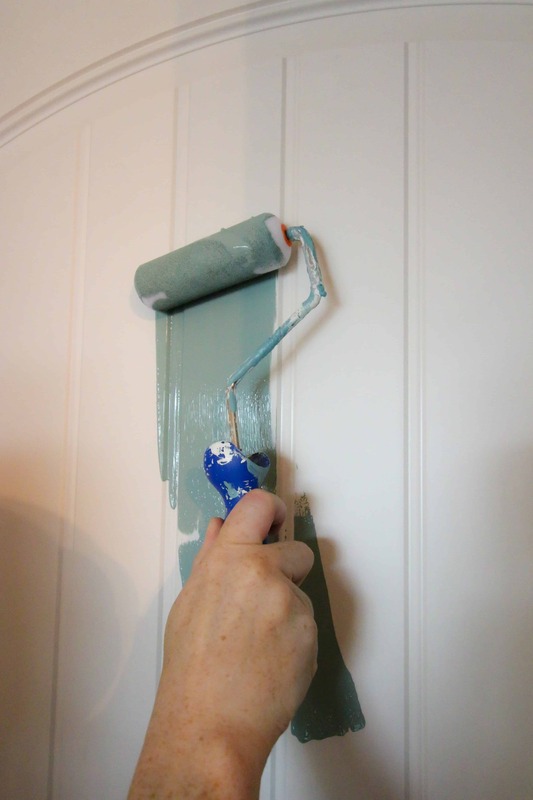 Here is how to paint a door – a really simple tutorial. It’s true – we have painted a few doors in our house already. 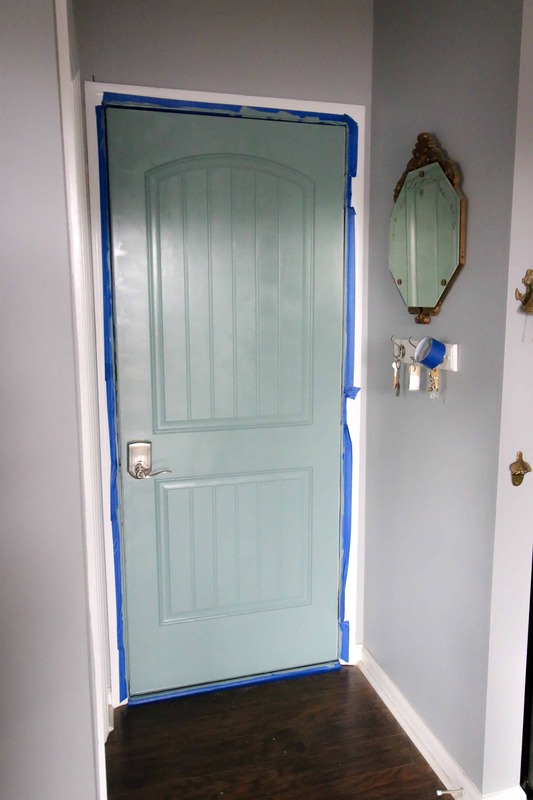 First we painted our front door a mint green color using a paint roller. 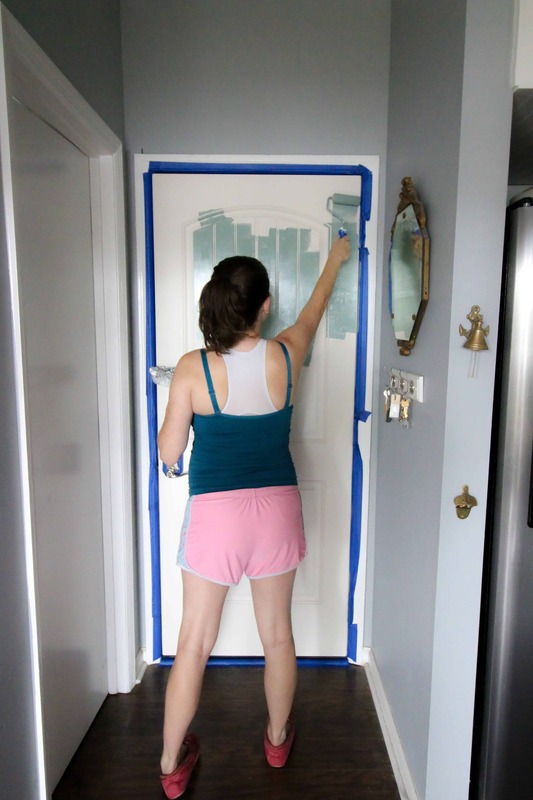 Then we painted our door to the screened porch a teal color using a paint sprayer. We even wrote a post detailing the pros and cons of painting a door with a paint sprayer versus painting a door with a roller. 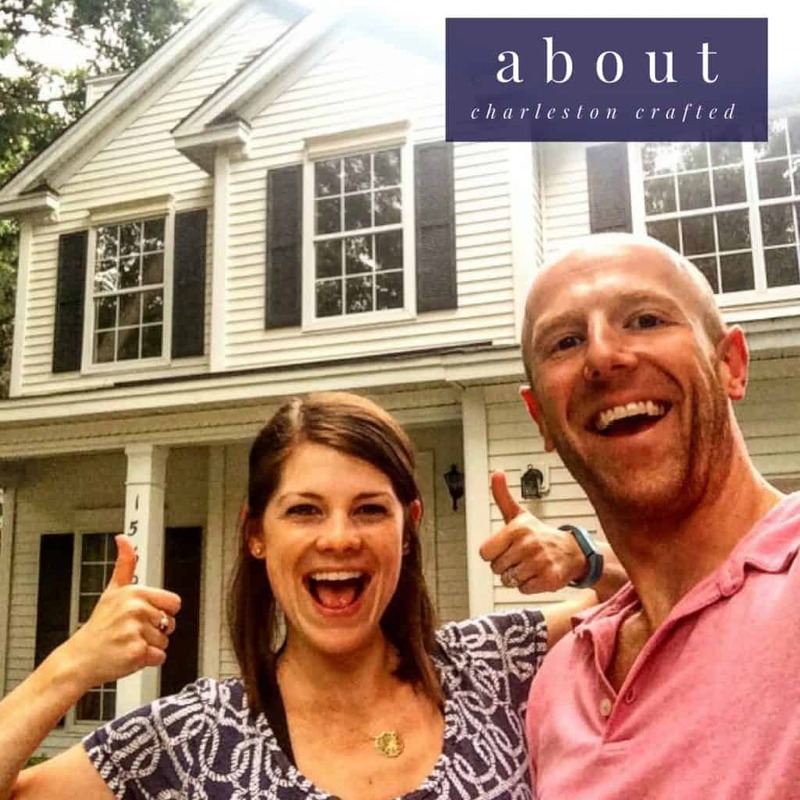 Today we wanted to share some frequently asked questions that we get about how to paint an exterior door and share some of the knowledge that we have accumulated across these many projects! If you’ve been reading with us for a while, you might remember that last year we replaced our door from our kitchen to our garage with a gorgeous Therma-Tru Benchmark door, available exclusively at Lowe’s. I absolutely love the look and love how much energy that this new door allows us to save. However, I decided that I wanted a pop of color in this little nook and decided that painting the door was the easiest way to get that. A well thought out color scheme can bring out your personal style or the style of your home. Therma-Tru Benchmark doors come in many colors and stains. Last year, I selected a white door to let the design really shine. While I love the detailing and look of our Therma-Tru Benchmark door, I am excited to bring in some color. We chose to use the same color of paint that we used on the cabinet and pegboard shelving in our laundry room. Repeating colors allows for continuity throughout your home and also saves resources if you can use up the second half of a can of paint that you already have on hand instead of having to buy new paint. What kind of paint should I use on a door? If you are painting an exterior door, you will want to have exterior grade paint. Additionally, many brands that are available at your local hardware sell door-specific paint. What finish of paint should I use on a door? 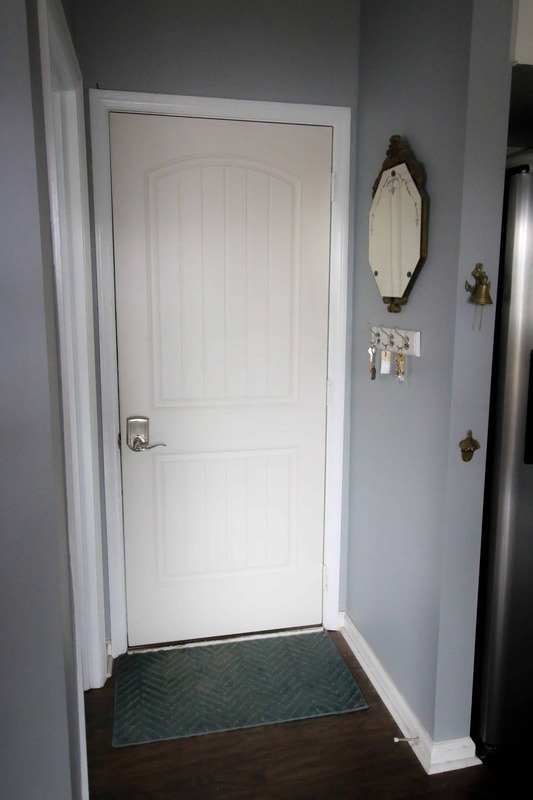 Semi-gloss is the traditional paint finish for a door. How do I paint a door without brush marks? The best way to paint a door without brush marks is to not use a brush! We recommend a roller or a paint sprayer. We compare and contrast these two methods of painting a door in this blog post. 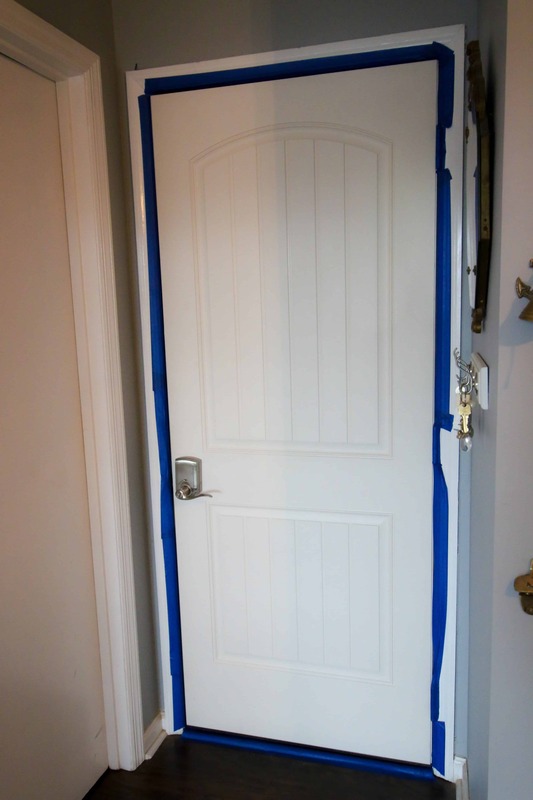 Do you need to remove a door before painting it? No, you do not need to remove a door from the hinges or door frame before painting. Just use painters’ tape to tape off the door frame to keep it paint-free. If you’re going to use a paint sprayer, tape some paper to the walls around the door to stop the overspray from getting on your walls. How do I choose a color to paint my front door? Doors are a great way to add a pop of color to a space! However, you most likely want to select a color that you already use in your home decor. Whether it is the color of your walls in your entry way, the color of your kitchen cabinets, or your favorite color to buy throw pillows in, choose a front door color that you love! It’s also a good idea to choose a front door color that provides some contrast to the surrounding walls. If your home is light colored, a dark or bright color will pop a lot more than a pastel. This is a great way to make your door a statement piece! Do you have any great tips for painting a door? « Can I Use a Barn Door for a Bathroom?